Pinnacle Rock is the home of the Mazken in the Shivering Isles, located in Dementia at the southern tip of the Madgod's Boot. This is the Mazken's most sacred place, as it contains the Wellspring of the Mazken. The souls of the fallen are called from the Waters of Oblivion to the Font of Rebirth by use of ceremonial chimes. The stronghold was a gift from Lord Sheogorath, and usually no one—not even Sheogorath himself—are permitted inside its sacred halls. In 3E 433 Pinnacle Rock was invaded by Order. This was rumored to have been caused by the subterfuge of Syl, a previous Duchess of Dementia who had been converted to a Priestess of Order in the coming Greymarch, although this conflicts with the rumors of her assassination. The effects of this infiltration was devastating on the realm's army. Order crystals covered the Wellspring, drying up its waters and turning the Mazken to stone. Sheogorath's Champion, who had been granted access to the stronghold to fight the invading Knights of Order, was able to shatter the crystals around the Wellspring and restore the Mazken, who were then able to defeat the remaining forces of Order. 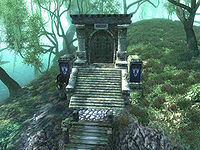 For in-game information on Pinnacle Rock, see the Shivering Isles article. ^ a b Dialogue of the Mazken in the Shivering Isles. ^ a b Events of the Shivering Isles. ^ Alternate events of the Shivering Isles. This page was last modified on 19 January 2019, at 16:21.